How Much Does it Cost To Repair or Replace a Windshield? Most windshields are made of two sheets of glass and a plastic layer curved and laminated between them. This is what makes them stronger. The windshield has an important role – to protect the driver and other passengers in case of a collision and to prevent the car roof caving in. How much will it cost you to fix or replace the windshield? Depending on the length of the crack and if it isn’t too big to be repaired, fixing it will cost you around $50 to $200. If you only want to get rid of a small chip or scratch, it won’t cost you more than $10 to $50, and the price depends on whether you go into the shop or have a mechanic come to you to fix it and on your location. If you’ll repair the windshield in more than one place, any additional chips or scratches will add around $10 – $30 to the final cost. People usually end up spending and average of $80 when repairing their windshield. The cost of fully replacing a windshield in a professional shop will cost you $100 to $500, based on the make and model of the car, the type of windshield, the year of your vehicle and whether you use aftermarket glass or an original equipment kit. If you have a rare or vintage vehicle and need to change its windshield, you must know that it will cost you anywhere from $500 to $1,500, if not more, depending on how rare the part is. If you’re trying to fix a chip or crack by yourself, you should know that not all cracks can be fixed. You shouldn’t try to fix cracks that are too deep, long or blocking the driver’s sight. If you’re not sure if a chip can be fixed or not, you should take your car to a mechanic. In the windshield replacement cost you’ll usually have included everything from the glass, adhesive, cleaning and labor.The full cost shouldn’t be more than $100 – $500 for most cars. 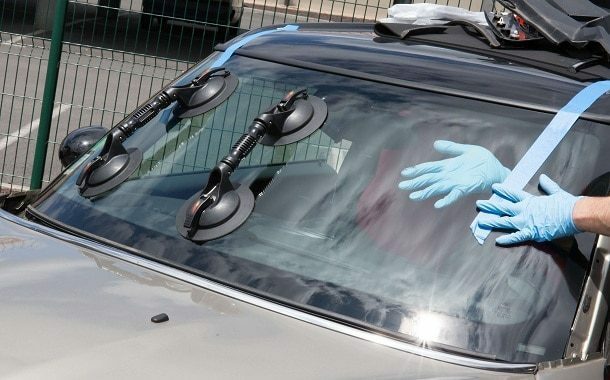 Windshield replacement shouldn’t last more than two hours, but after the job is done, the car shouldn’t be used for at least 12 hours, to let the adhesive get in its strongest state. Ask if you’re eligible for a warranty, as most shops will offer one for windshield replacement. If your vehicle has rubber moldings around the windshield, you’ll pay a maximum of $30 for a new set. You won’t need to replace the wipers at the same time with the windshield, but if they’re old enough, you should think about changing them, just to be sure you won’t get the new glass scratched. Wipers cost around $10 – $40. Check your auto insurance, because most insurance companies offer full coverage of windshield repairs or replacements. There are tutorials online showing you how to change the windshield yourself, but don’t try it unless you have mechanic skills and the necessary tools to do it properly. The windshield is an important safety measure of the car, so don’t just pick the cheapest shop when you change it. Before picking a shop or mechanic, be sure to check the business for any complaints or negative reviews. Although it might seem expensive for the average working Joe to change the windshield for a longer scratch, this might save your life, because in case of a collision the windshield might stop the roof from caving in and external objects from hitting your head. https://www.thepricer.org/wp-content/uploads/2016/09/Windshield-Replacement-Cost.jpeg 380 610 qSign http://www.thepricer.org/wp-content/uploads/2016/11/pricerlogonew.png qSign2016-09-21 03:15:032016-10-06 20:53:03How Much Does it Cost To Repair or Replace a Windshield? How Much Does a Locksmith Cost? How Much Do Teacup Pigs Cost?